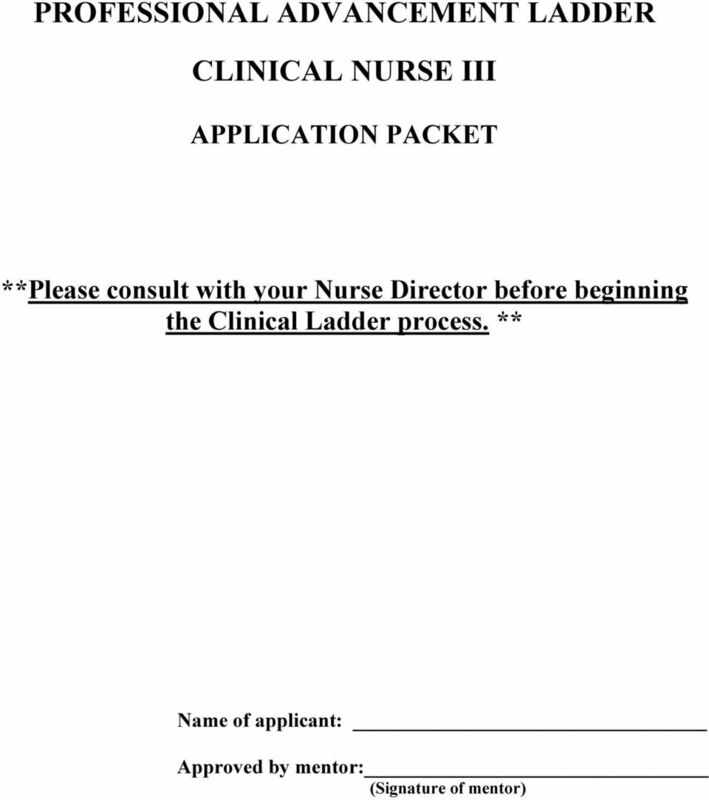 Download "PROFESSIONAL ADVANCEMENT LADDER CLINICAL NURSE III"
2 CLINICAL LADDER APPLICATION PACKET Clinical Nurse III I. Demographic/Employment Data Name: Date of Hire: Current Clinical Ladder Level: Unit(s): Weekly Scheduled Hours: (If per diem, indicate number of hours worked over prior 12 months.) 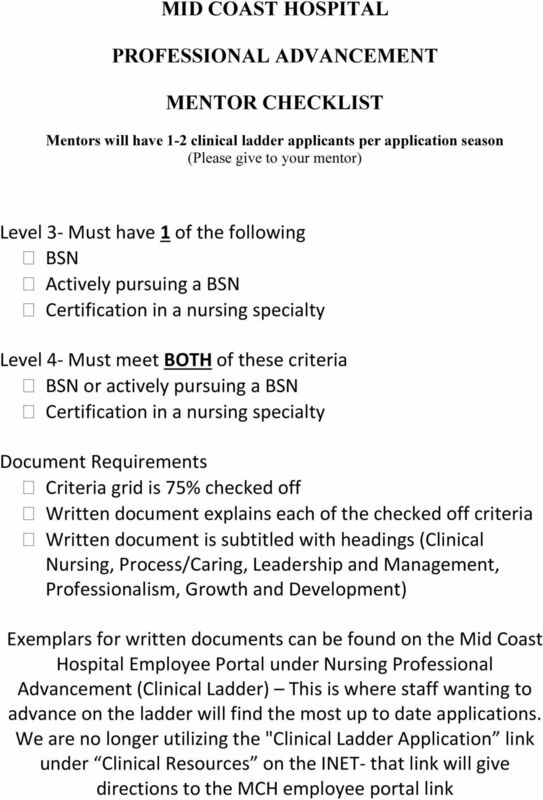 Nurse Director: Time on Current Unit: Time in Current Specialty (Med-Surg, ICU, etc. 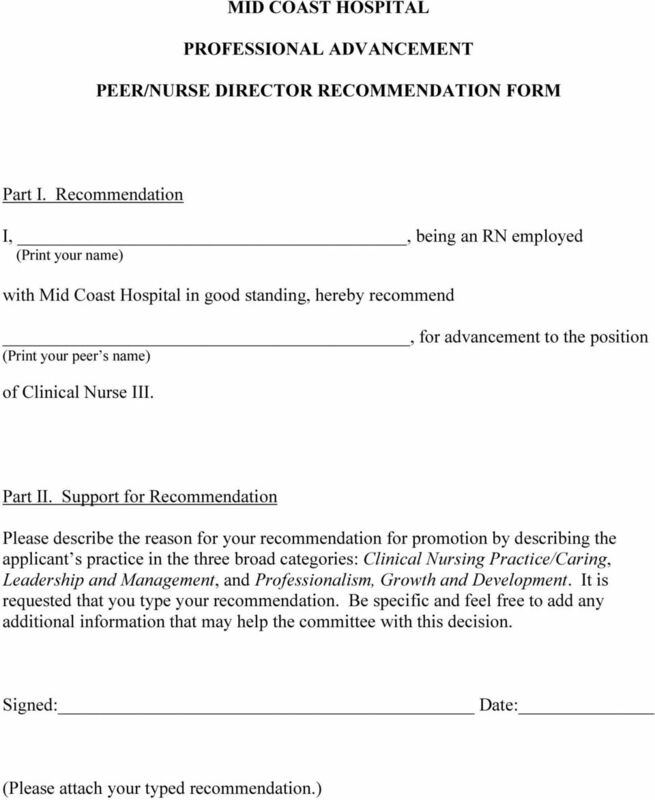 ): Identify 2 peers (at least one from your unit) who wish to recommend you for advancement: Please use the attached forms for your Nurse Director and Peer Recommendations. 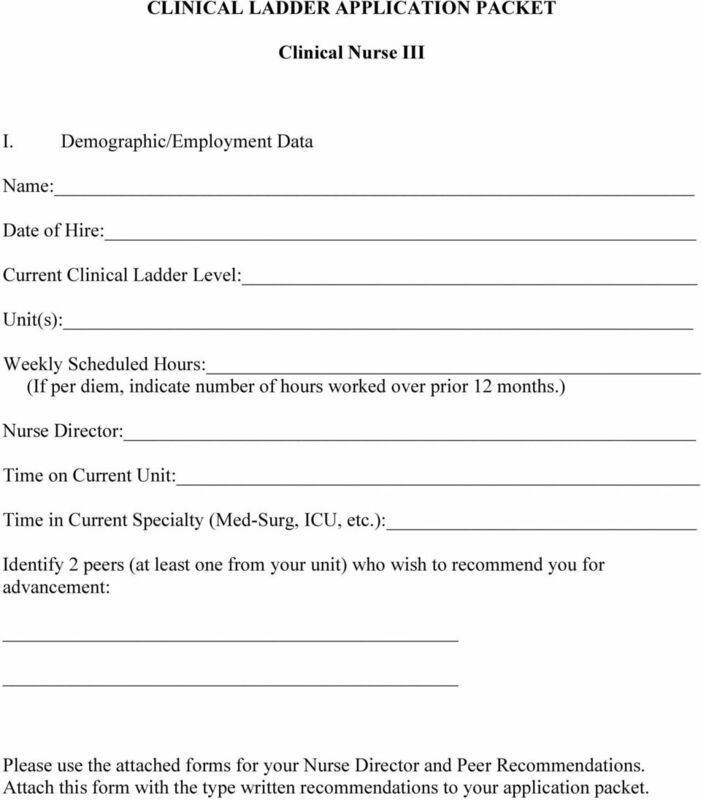 Attach this form with the type written recommendations to your application packet. 9 2) Teamwork multidisciplinary teams. vi) Is a member of a local, state, or national professional nursing organization. vii) Is a member of a community or healthcare organization. b) Research. The RN integrates research findings into practice. i) Familiarizes self with sources of nursing research available. ii) Assists with PI data collection on unit. iii) Demonstrates awareness of research projects on unit. iv) Incorporates research specific to specialty into clinical practice. v) Problem solves for practice issues on unit by researching best available evidence, developing clinical questions, or research project design. vi) Coordinates data collection. a) Communication and collaboration in direct patient care. i) Collaborates and communicates with the patient, family members, and other health care team members to meet the patients/s needs. ii) Communication ensures the continuity of care. iii) Coordinates care delivery with outside agencies and providers. iv) Includes time estimate for attainment of expected outcomes. v) Troubleshoots problems with multidisciplinary care delivery. b) Collaboration. The RN collaborates with patient, family, and others in the conduct of nursing practice. i) Recognizes and understands the importance of involving patient, family and other healthcare providers in implementing patient plans. ii) Implements the discharge plan, involving patient, family and health care providers. 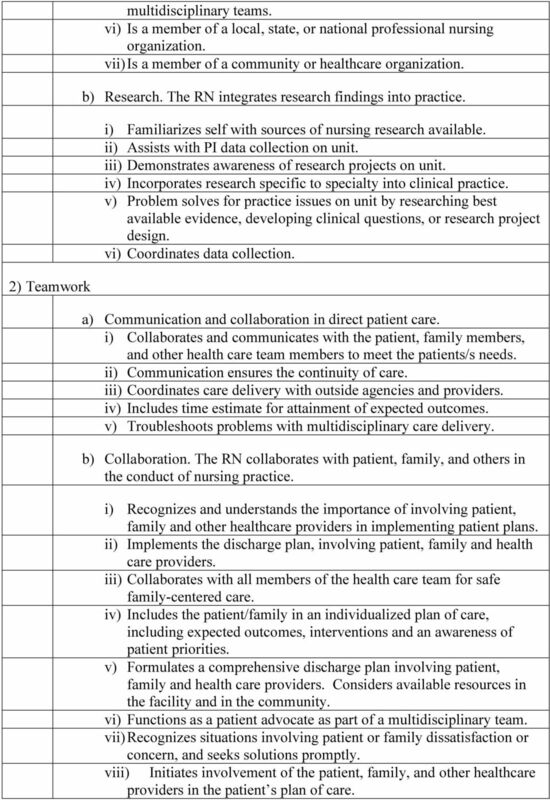 iii) Collaborates with all members of the health care team for safe family-centered care. iv) Includes the patient/family in an individualized plan of care, including expected outcomes, interventions and an awareness of patient priorities. v) Formulates a comprehensive discharge plan involving patient, family and health care providers. Considers available resources in the facility and in the community. vi) Functions as a patient advocate as part of a multidisciplinary team. vii) Recognizes situations involving patient or family dissatisfaction or concern, and seeks solutions promptly. viii) Initiates involvement of the patient, family, and other healthcare providers in the patient s plan of care. 10 3) Attendance ix) Serves as a patient advocate role model. x) Independently resolves patient or family complaints. c) Communication and Collegiality. The RN interacts with and contributes to the professional development of peers and colleagues. i) Follows established communication, dress, and behavior guidelines. ii) Addresses interpersonal conflicts directly with individuals involved, in a positive manner, utilizing supportive resources as necessary. iii) Functions as a team member by assisting colleagues. iv) Provides feedback to colleagues directly in a non-threatening relationship-preserving fashion. v) Treats mistakes by self and others as opportunities for growth, thereby creating a culture in which feedback is not only safe, but expected. vi) Assists the preceptor in the orientation of staff members. vii) Sets a positive tone, even in challenging situations, by treating others with caring and respect. viii) Independently communicates in a manner which permits and resolves conflicts. ix) Actively promotes self-care, stress reduction, and personal balance within the unit. x) Demonstrates a willingness to be a team member and to work both collaboratively and independently. xi) Designs and implements an individualized student or new employee orientation program. xii) Freely shares clinical knowledge and skills with others in an approachable manner. a) May be depended upon to work scheduled shifts. b) Arrives to work on time. 4) Professional Nursing a) Patient care: i) Provides safe patient care according to established standards, policies and procedures. ii) Evaluates and communicates the appropriateness and effectiveness of established standards, policies, and procedures. iii) Assists in the development of new patient care standards, policies, and procedures in response to identified needs. b) Education and self development. 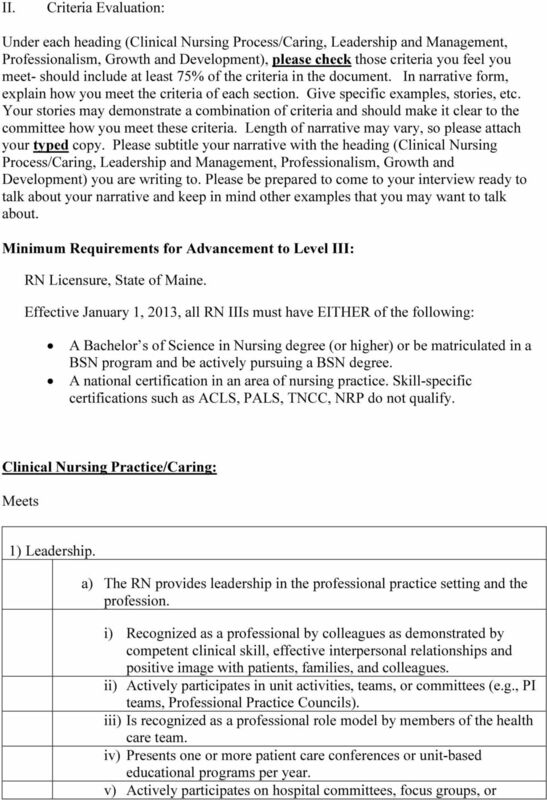 The RN attains knowledge and competency that reflects current nursing practice. 11 i) Reads current nursing literature. ii) Maintains professional records that provide evidence of competency and lifelong learning. iii) Assumes responsibility for meeting educational needs including mandatory programs. iv) Obtains a minimum of 25 approved contact hours or a 3-credit hour professional development course per year. v) Reads current nursing literature and incorporates this information into clinical practice. vi) Reads and critiques articles from professional journals. vii) Attends conferences, workshops, seminars and shares new knowledge with colleagues. c) Professional Practice Evaluation. 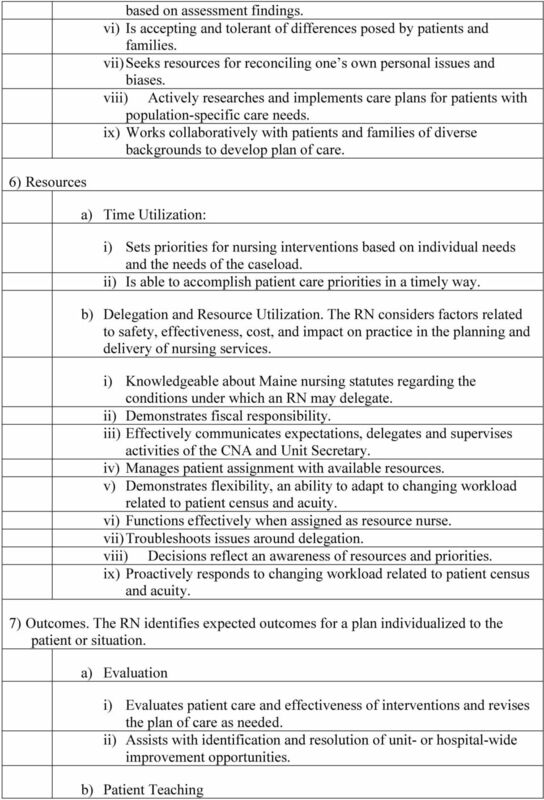 The RN evaluates one s own nursing practice in relation to professional practice standards and guidelines, relevant statutes, rules, and regulations. 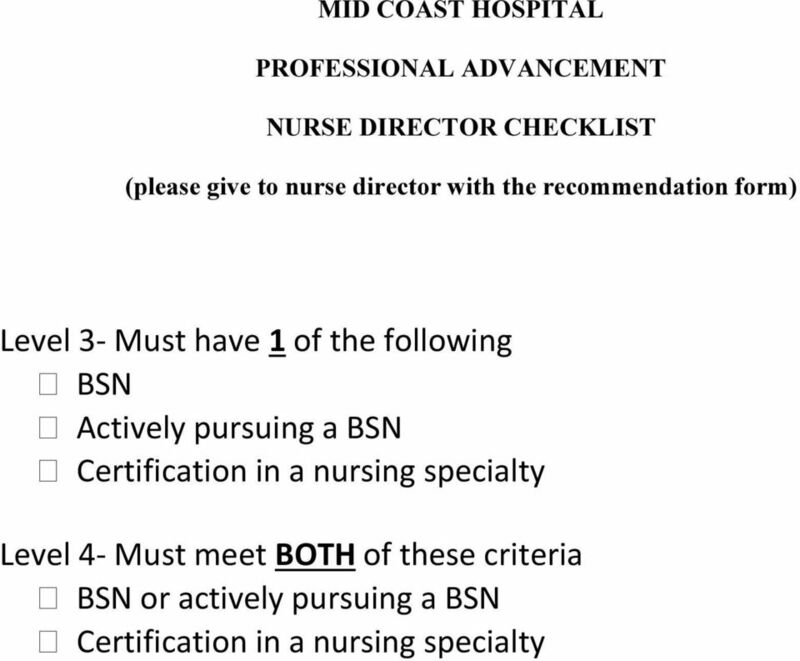 i) Recognizes own limitations and asks for assistance/direction from resource person/preceptor. ii) Evaluates areas of professional development needs and develops goals and a plan to meet them with the nurse manager annually. iii) Assumes responsibility for completion of CBO tool. iv) Recognizes own limitations and asks for assistance/direction from resource person. v) Serves as resource to CN I and II nurses, CNAs and ancillary staff in routine clinical situations. vi) Develops a personal plan for professional improvement and advancement and is actively pursuing it. vii) Independently analyzes developmental goals and outlines a plan to meet these goals, with ongoing evaluation of progress. d) Ethics. The RN integrates ethical provisions in all areas of practice. 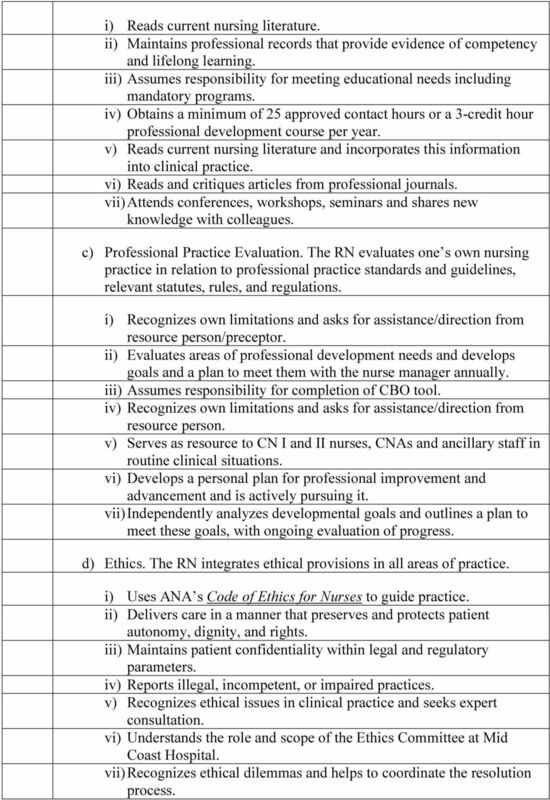 i) Uses ANA s Code of Ethics for Nurses to guide practice. ii) Delivers care in a manner that preserves and protects patient autonomy, dignity, and rights. iii) Maintains patient confidentiality within legal and regulatory parameters. iv) Reports illegal, incompetent, or impaired practices. v) Recognizes ethical issues in clinical practice and seeks expert consultation. vi) Understands the role and scope of the Ethics Committee at Mid Coast Hospital. vii) Recognizes ethical dilemmas and helps to coordinate the resolution process. 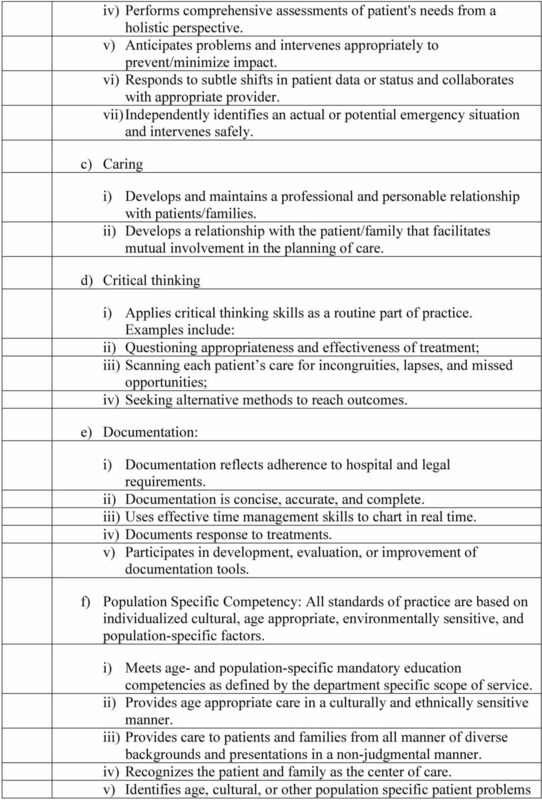 12 5) Care Delivery e) Participation in Shared Governance: i) Attends & participates in unit staff meetings. 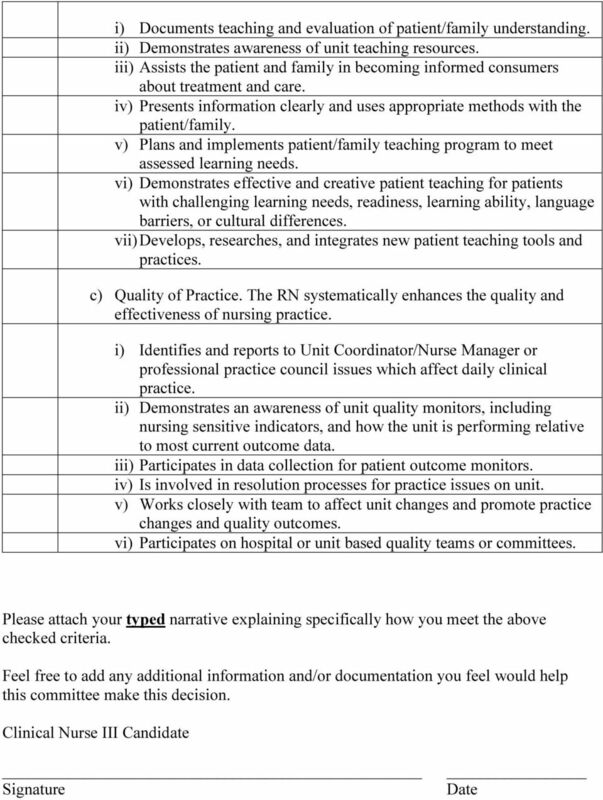 ii) Knowledgeable of shared governance opportunities and responsibilities, both on the unit and hospital-wide. iii) Demonstrates support of the processes for shared governance and collective decision making, as well as the goals and decisions reached. iv) Provides positive feedback & constructive criticism through appropriate channels and forums. v) Actively participates on a hospital or unit based team. vi) Shares accountability for outcomes. a) Patient Safety : i) Maintains safe and therapeutic patient care environment and equipment which minimizes risk, injury, error, infection, and allows healing. ii) Uses best practices in communications in transferring or reporting patient care, using SBAR and handoff communication. iii) Demonstrates knowledge and skills in location, operation, care and trouble-shooting of unit equipment independently. iv) Serves as resource person to others for safe practices. v) Addresses workarounds in patient safety directly with nurse involved; escalates issue as needed with director. vi) Makes safety practices a habit; adopts new safety initiatives as they are developed. vii) Consistently demonstrates compliance with safe practices without using workarounds. viii) Active in hospital- or unit-wide development, and teaching of safety practices. 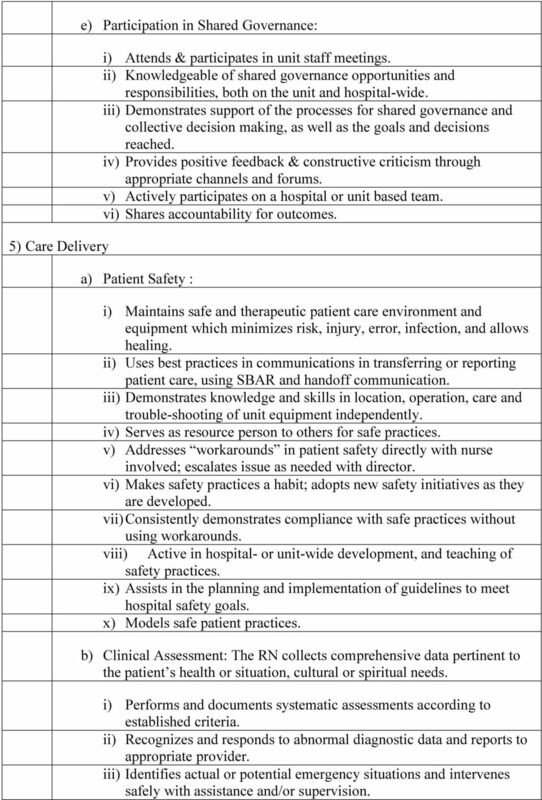 ix) Assists in the planning and implementation of guidelines to meet hospital safety goals. x) Models safe patient practices. b) Clinical Assessment: The RN collects comprehensive data pertinent to the patient s health or situation, cultural or spiritual needs. i) Performs and documents systematic assessments according to established criteria. ii) Recognizes and responds to abnormal diagnostic data and reports to appropriate provider. iii) Identifies actual or potential emergency situations and intervenes safely with assistance and/or supervision. Rubric to Evaluate North Carolina s School-Based Physical Therapists Standard 1: School-based physical therapists demonstrate leadership. STAFFING. a. 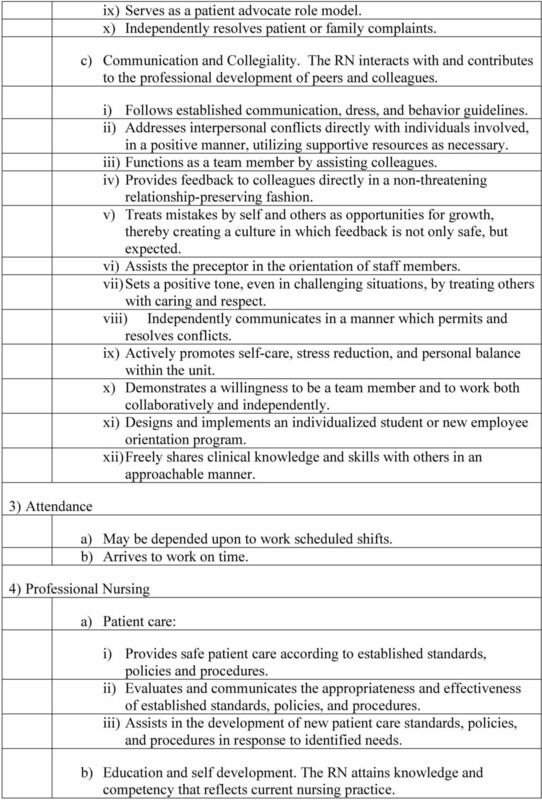 Changes from nine dimensions of nursing to four dimensions/career paths with nine criteria.